I received these shooting drills from Dennis Hutter, Head Women’s Basketball Coach at Mayville State University. His website, www.coachhutter.com . The website has more shooting, individual development workout, and leadership videos. We picked this drill up from the coaches at the University of Oregon Women’s Basketball Program. 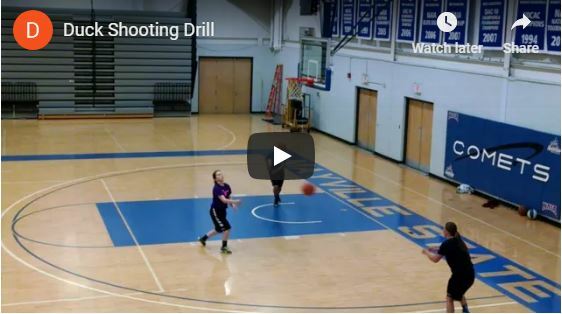 This is a great shooting and competition drill for your players. The shooter will shoot for 5:00 straight from seven different spots. Corner, Wing, Pro Spot, Top of Key, Opposite Pro Spot, Opposite Wing, Opposite Corner. Shooter starts in the corner. The goal is for the shooter to make two shots in a row, once they make two shots in a row, they advance to the next spot. They keep working around the arc, advancing every time they make two three’s in a row. Spots “7” & “8” are both located in opposite corner and spots “14” & “15” are back at starting corner spot, and spots “21” & “22” are back in opposite corner and so on. Your score is the spot you finish up on when the 5:00 is up. Because we are a transition team, we like to use drills that involve a lot of sprinting and shooting off of the sprint, like we would in transition. With “W” shooting, we use the same seven spots as we use in “Duck Shooting” (Corner, Wing, Pro Spot, Top of Key, Opposite Pro Spot, Opposite Wing, Opposite Corner). The shooter will start in the corner. Shooter will shoot and then run and touch the half line and then advance to the next spot. Shooter will shoot a total of seven shots. Goal is for shooter to make five or more shots in 40 seconds or less.